This Quick Start builds an Internet of Things (IoT) Camera Connector environment and serverless architecture on the Amazon Web Services (AWS) Cloud in about 5 minutes. You can use this Quick Start to automate the connection—and simplify the management—of thousands of cameras through AWS IoT Core. You can also enable video streaming to Amazon Kinesis Video Streams for storage, playback, and machine learning–driven analytics. The Quick Start includes a template and Config App to rapidly discover, provision, connect, and manage supported cameras and stream their output to Amazon Kinesis Video Streams in your AWS account. The template creates resources in your AWS account to provision cameras as IoT things. The Config App helps you discover supported cameras on your local network. It also provides IoT certificates and other information necessary for supported cameras to stream video content to Amazon Kinesis Video Streams. In 5 minutes or less, you can connect up to thousands of cameras and begin implementing streaming-video analytics solutions. This Quick Start was developed by Onica, Inc. in collaboration with AWS. Onica is an APN Partner. An AWS IoT policy to associate with connected cameras. 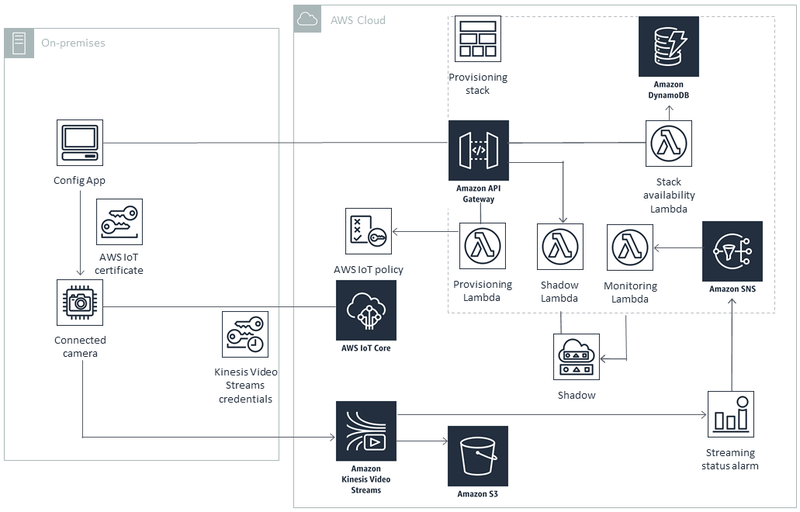 An AWS Identity and Access Management (IAM) role for connected cameras to stream to Kinesis Video Streams. An Amazon DynamoDB table to store provisioning keys. Once provisioning is complete, you should remove the keys. AWS Lambda functions to create a provisioning key and a role alias, verify the stack, and provision cameras. Amazon API Gateway to expose provisioning endpoints through HTTPS. Amazon CloudWatch alarms to expose camera streaming status through an Amazon Simple Notification Service (Amazon SNS) topic, and update the associated camera’s IoT thing shadow. A separate Config App installable for provisioning cameras on the local network to stream to your AWS account. To build your AWS IoT Camera Connector environment for provisioning connected cameras and streaming camera output to Kinesis Video Streams, follow the instructions in the deployment guide. Launch the Quick Start. The deployment takes about 5 minutes. Download the Config App for the AWS IoT Camera Connector. Provision your cameras in the Config App. Verify the streaming capabilities of the camera output, and remove the Provisioning Key from the DynamoDB table. The AWS CloudFormation template for this Quick Start includes configuration parameters that you can customize. For cost estimates, see the pricing pages for each AWS service you will be using. Prices are subject to change. Tip After you deploy the Quick Start, we recommend that you enable the AWS Cost and Usage Report to track costs associated with the Quick Start. This report delivers billing metrics to an S3 bucket in your account. It provides cost estimates based on usage throughout each month, and finalizes the data at the end of the month. For more information about the report, see the AWS documentation.